The “ADC in 2017” meme has taken a strange turn into the woods. Due to the creation of lethality and changes to the assassin class over the offseason, ADCs started the year in a rough spot. They complained that they had no agency, that whichever team won top lane or mid lane would just start a party in the bot lane to which they were merely observers—if not victims. The few ADCs being picked were ones like Ezreal, who had good mobility and a safe laning phase. Now, near the end of the year, things could not be more different. A lot of games are still won with parties in the bot lane. But that’s now due to the enormous impact ADCs have in teamfights and around objectives. The return of hyper-scaling carries like Kog’Maw and Tristana and the advent of tanks in the top lane, jungle, and support, have made protect-the-ADC comps valuable. At the same time, that’s pushed out ADCs like Ezreal who take too long to scale and are fairly useless at two items. Then Team WE jungler Xiang “Condi” Ren-Jie locked-in Ezreal. In the jungle. In a crucial match against Invictus Gaming in the LPL Regional Qualifier. Team WE had been eliminated by Invictus in a tough five-game series in the LPL playoffs, and now the two teams were fighting to the death for the region’s last Worlds seed. And this is the time Condi tried a pocket pick. The game did not go well for Condi. Team WE got massacred in a crucial game, but managed to pick up the series victory when Condi switched to meta junglers like Jarvan IV. We thought the Ezreal experiment was over. Sure, the pick inspired many players to give it a go, some with better results than Condi. But surely, that would be the end of Ezreal jungle this year, right? Wrong. Because Condi did it again—at Worlds. And now the copycats included a fellow Worlds jungler—Cloud9’s Juan “Contractz” Garcia. What in the blazes is going on? Well, it goes back to that ADC meta. Both Ezreal picks over the weekend actually struggled early. Condi in particular got bullied out by Sebastián “Oddie” Alonso Niño Zavaleta’s Kha’Zix, one of Ezreal’s chief counter picks as a jungler. And despite Ezreal’s early power, Contractz was late to every play in Cloud9’s game, watching helplessly as his bot lane fed. Then something curious happened. Because jungle Ezreal bypasses his Tear of the Goddess, he’s able to get to two items faster. Often, a finished Warrior enchantment and a Sheen are all he needs to deal serious damage. In mid-game fights around objectives, Ezreal’s mobility gives him a ton of safety as he kites around fights. In the above clip, Dire Wolves could never get to either of Cloud9’s ADCs, and didn’t have nearly enough damage of their own. 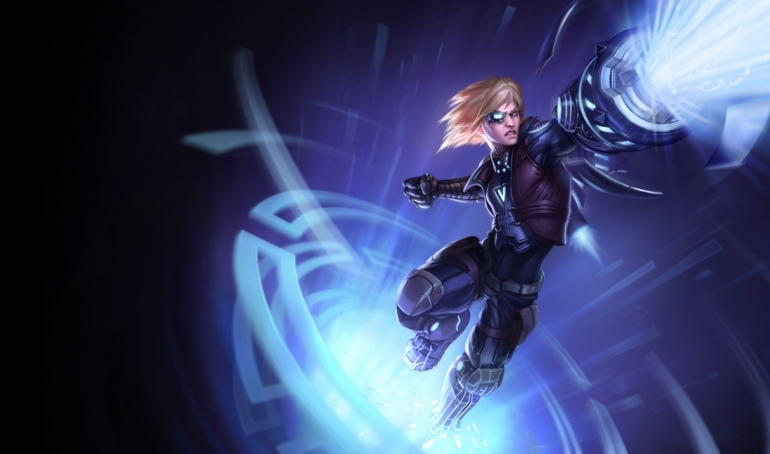 In an ADC-focused meta, Ezreal jungle gives teams even more power as games go on. He has very clear weaknesses, but like Corki mid, the sheer amount of damage he can throw out makes it a tantalizing pick. Combine that with his solid early game, where he can gank at level 2 with red buff, and jungle Ezreal has very different power spikes than the bot lane version. Contractz’ Ezreal did the most damage on his team, while Condi’s was second to Tristana. Two mobile ADCs with tanks and enablers around them is just too OP in this meta. Cloud9 did pick Ezreal under little pressure to win, however—they were already up 3-0 in the play-in stage and shoo-ins to move on to the bracket round. The team wasn’t putting much at risk, especially considering they had clearly shown themselves a class above their play-in competition. And there are issues with jungle Ezreal. His lack of utility makes him very risky, and he’s extremely squishy. Fail to get off the ground, and he will get bullied by the likes of Sejuani. Team WE picked Ezreal still needing a victory, but the real test will start this weekend and continue into the Worlds main event. Will Ezreal make another appearance, or is this a niche pick that will fall to the wayside?